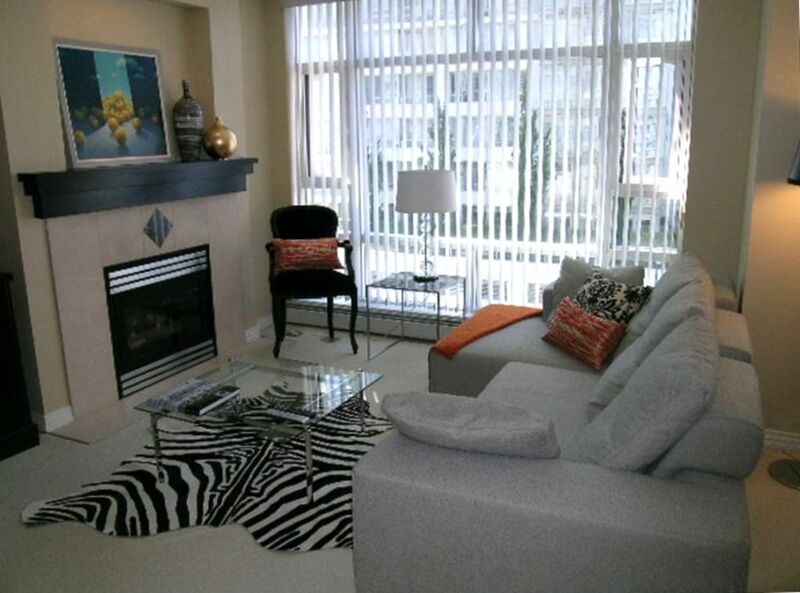 Beautifully appointed 1 bedroom and den in prime Yaletown area. Sunny, extremely well-laid out and well equipped interior is a comfort par excellence. Visit us for an unforgettable experience. Whether you create your own gourmet meal in a professionally equipped kitchen, lounge in a living room next to a warm fire, or rest in luxuriously equipped bedroom with a beautiful views over marina, you will feel home away from home. Apartment has just got a brand new walnut hardwood floor. Exquisite furnishings imported from all over the world are here for your pure enjoyment. 600TC Italian cotton bed linens and bathroom towels will enhance your experience and touch your senses. Master Bedroom has a very comfortable queen size bed, large closet space, regency brass and marbletop gueridon night tables equipped with marble and leather base lamps. Master bathroom has a full bath, shower and sink set in marble counter. Living Room has an imported sectional sofa in finest fabric, which if required turns into a bed for one person and is very comfortable, side and coffee table with a lounger and lighting complete the ambient. A den separated from the living room by a glass wall lets the natural light in but provides a quiet ambient whether you choose to work or just rest. Work table and an executive chair completes the room. A simple yet beautiful ottoman turns into a full size single bed, should you need a spot for additional guests. Living room is equipped with high end 37” flat screen TV, video and audio system. Den is equipped with a high speed internet as well as wireless system. The whole apartment is equipped with original art pieces imported from Europe. Prime lively, vibrant and most of all very friendly neighborhood filled with families and young people will welcome you. Urban Fare a grocery store is located right in the building, ethnic restaurants and food stores are spilled around the whole neighborhood. Go for a light stroll and experience the best neighborhood in all of the Vancouver. Whether you are a Starbucks fan or more in tune with Italian flavor it is right here for you. Expansive green parks, 15km seawall walkway goes right by the building, community play fields, tennis courts are there for everyone's enjoyment. Whether you like shopping, dining or simply enjoying the sun, everything is right here. Come & enjoy! This condo is personally managed by owner. We have poured our love into it and we would very much like you to like it and enjoy the experience as we do. The best testaments are from our guests who have enjoyed their stay while visiting Vancouver. For more information or any query please do call us at number listed below, or email us. Please note: damage deposit is equal to half month's rent and it ranges depending on time of the year it is rented. Damage deposit quoted in the rates section of the listing is for the standard time (January-May and October-December). I live in the same community. I fell in love first time around and wanted to stay in the area. It is very central and convenient location of downtown Vancouver, walking distance to pretty much all hot spots Vancouver has to offer. Ideal community neighborhood, with great selection of coffee shops, restaurants, stores, playgrounds all at the ocean shore. Great building, great amenities, wonderful surroundings. 600TC Egyptian Cotton high end bed linens, bath towels and kitchen towels maintained to the highest standards. Washer and dryer located in the unit for your own convenience. Cable TV included in the package. The pictures of the apartment do not depict the actual condition. The linens were poor, the pillow cases were ripped. Bed linens were inadequate. Towels were old. The noise level was Extreme. The chairs around the dining table were in poor condition. the kitchen appliances were old and need to be replaced. The carpets curling up and stained. Couch was extremely uncomfortable. Bathroom shower adjustment came off in my hand. the whole apartment needs refurbishing. can not recommend this represented apartment. Thank you Biljana for your very well eqipped condo . It has a very comfortable bed with crisp linen and it is in a fabulous location with all you need very close by. If you are thinking of booking a condo, book here with confidence as we found it fantastic abd Biljana was so helpful in the booking process and when we arrived. Having stayed at this condo for one month, I can recommend highly recommend it. The place was clean and very well stocked with all necessary items. All appliances worked well, and the internet speed was strong. There is a little office area next to the living room, which is perfect for business travelers. The building is in a very nice area with all shopping, food, liquor store, etc...within a minute of two walk, or just downstairs. They have a nice pool and Jacuzzi and a small gym. The owners were very professional and took their time to walk me through their place and tell me about the neighborhood. The water taxis are just at the end of the street, along with the sea wall. In short, it is a very nice place to stay for an individual or a couple, and I would recommend staying here. Don't judge an apartment by its photos. This apartment was certainly acceptable however it is in need of a general paint refreshening. The photos and art work were not representative of what appears in the photos. Many amenities were present but not that practical. Location was great as was the building especially the pool and gardens. The small room off the living room was not that usable. Living room not practical because there was no table in front of the couch as shown. Owner was pleasant but it took nearly two months for her to return the deposit. We have just had a lovely week in this apartment. Great location . Very friendly welcoming owner. Well equipped in a fantastic neighbourhood with both Urban Fare and Starbucks below. Lovely garden area and secure parking available. Only a few steps from the Sea Wall path and Aqua Bus. Lovely linens provided and small balcony for watching the world go by. Rates are subject to change unless the reservation is confirmed.